The electronic and optical properties of two-dimensional layered materials allow the miniaturization of nanoelectronic and optoelectronic devices in a competitive manner. Even larger opportunities arise when two or more layers of different materials are combined. Here, we report on an ultrafast energy efficient strategy, using laser irradiation, which allows bulk synthesis of crystalline single-layered lead iodide in the cavities of carbon nanotubes by forming cylindrical van der Waals heterostructures. In contrast to the filling of van der Waals solids into carbon nanotubes by conventional thermal annealing, which favors the formation of inorganic nanowires, the present strategy is highly selective toward the growth of monolayers forming lead iodide nanotubes. The irradiated bulk material bearing the nanotubes reveals a decrease of the resistivity as well as a significant increase in the current flow upon illumination. Both effects are attributed to the presence of single-walled lead iodide nanotubes in the cavities of carbon nanotubes, which dominate the properties of the whole matrix. 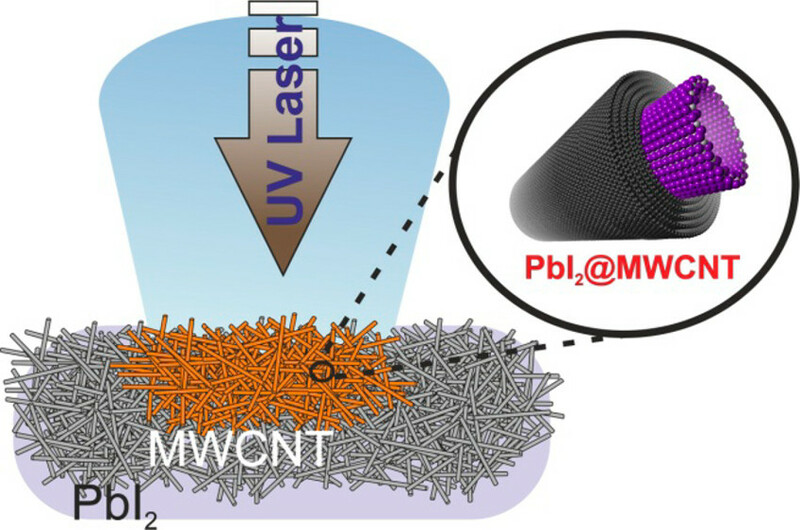 The present study brings in a simple, ultrafast and energy efficient strategy for the tailored synthesis of rolled-up single-layers of lead iodide (i.e., single-walled PbI2 nanotubes), which we believe could be expanded to other two-dimensional (2D) van der Waals solids. In fact, initial tests with ZnI2 already reveal the formation of single-walled ZnI2 nanotubes, thus proving the versatility of the approach.